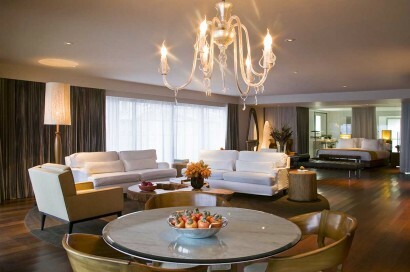 She has been the General Manager of the Fasano Philippe Starck designed property in Rio since 2007. Graduated from the Hotel School of Lausanne in Switzerland with a Restaurant & Hospitality University degree in 1991. Specialized in Hotels openings with Ritz-Carlton and Hyatt. The Fasano brings its incomparable hospitality to Rio de Janeiro. 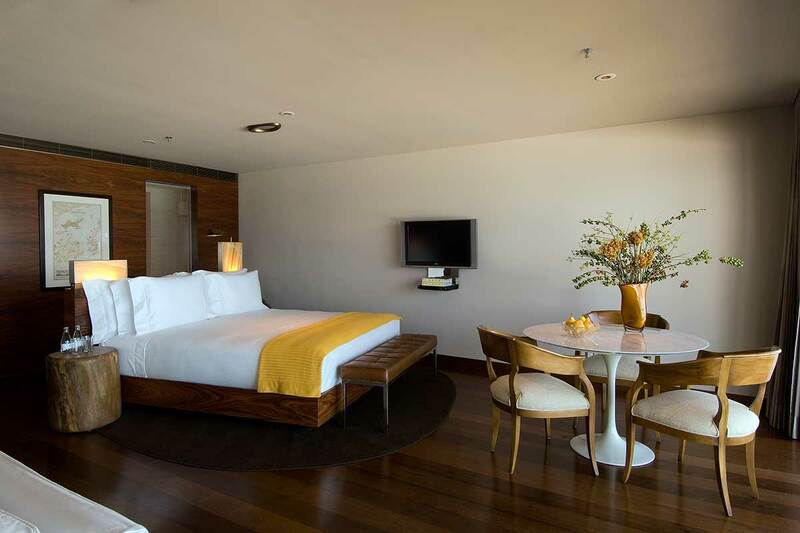 This new hotel is uniquely situated at the heart of Ipanema Beach, imagined by Philippe Starck, the décor is elegant and understated with signed pieces of the 1950’s and 60’s. a meeting point for locals and travellers. Located on Avenida Vieira Souto in the heart of Ipanema beach, Hotel Fasano Rio de Janeiro combines the glamour and sophistication of Rio’s most coveted address with the Fasano commitment to excellence. In his first hotel architecture project, Philippe Starck chose to reflect the heyday of the Bossa Nova era in the 50’s and 60‘s, when Ipanema blossomed into the city’s most charming neighbourhood. The hotel caters to both leisure and business travellers, offering the latest in-room technology• Guests can experience the exquisite Fasano cuisine at the elegant Fasano al Mare restaurant and enjoy signature poolside cocktails by the infinity pool, which overlooks the ocean. The unique view comprises the Morro Dois Irmãos, the Arpoador and Corcovado in one sweeping landscape. The Hotel Fasano was Philippe Starck’s first complete hotel project, and features Gaetano Pesce’s UP5 Chair and Sergio Rodruigues’ Diz and Voltaire armchairs. The superb infinity pool, one of the most beautiful pool in Latin America, with its stunning views of Ipanema. Exclusive beach service with chairs and sun loungers where guests can safely enjoy the renowned Ipanema beach. 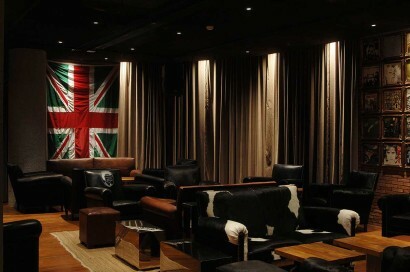 The Baretto-Londra bar with its award-winning cocktails, classic rock, celebrated DJ’s and live performances by world-famous bands. The Hotel Fasano has one of Rio’s most coveted addresses, situated on Avenida Vieira Souto in the heart of Ipanema beach. 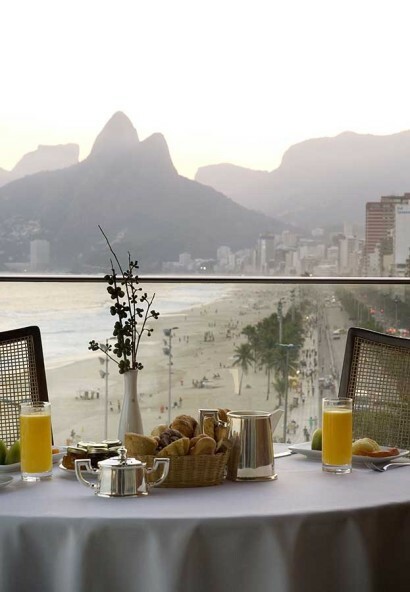 Hotel Fasano Rio de Janeiro is located at the legendary Ipanema Beach, which offers a host of cultural and shopping options, along with the city’s best bars and restaurants. The hotel is steps away from Copacabana beach and a short walk from Leblon. 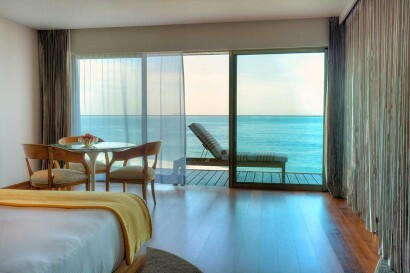 Babysitting and Fasano Bambini (special in-room amenities for children such as toiletries, linen, toys and candies). All 79 rooms and 10 suites have balconies, feature sumptuous hardwood floors, along with Starck’s Dali-esque ear-shaped mirrors (aptly named “ears that see”), and elegant Sergio Rodrigues chairs• King size beds with 300-thread-count Egyptian cotton sheets and white goose down pillows are strategically positioned in our oceanfront rooms so that they are always facing the horizon and an ocean view. 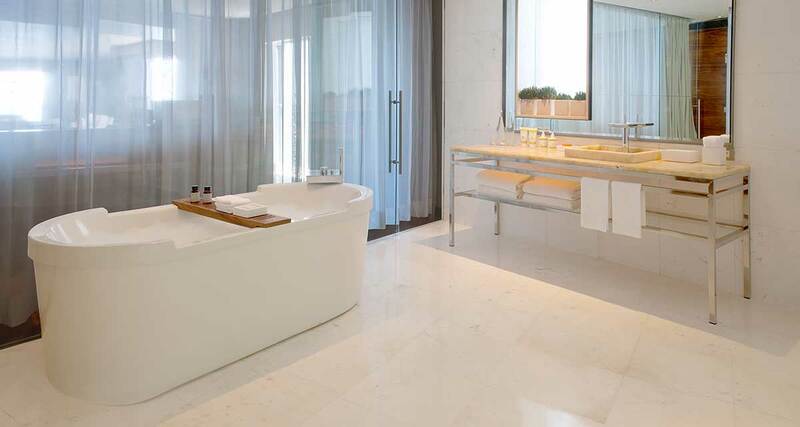 The marble bathrooms boast high-pressure showers and complimentary Ipanema flip-flops by Oskar Metsavaht. 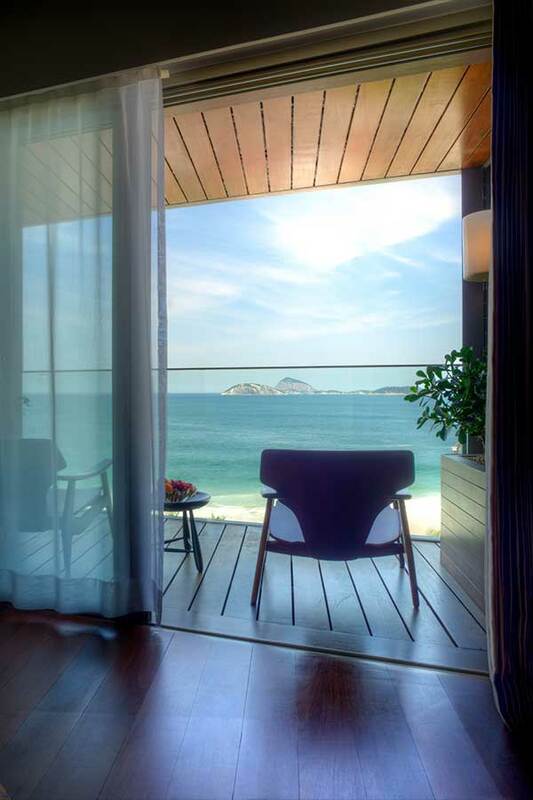 The oceanfront rooms have unparalleled views of Ipanema beach. • Spacious shower and Bidet. The culinary tradition of the Fasano family is the foundation of the group’s hotels. 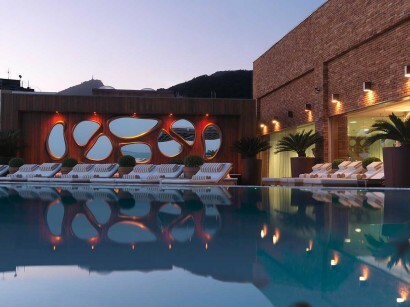 In Rio de Janeiro, the hotel is served by three restaurants: Fasano al Mare, haute Italian cuisine with a seafood flair; the poolside bar, for guests who prefer to take their meals poolside; and Baretto-Londra, a bar and nightclub with DJs and music every night. 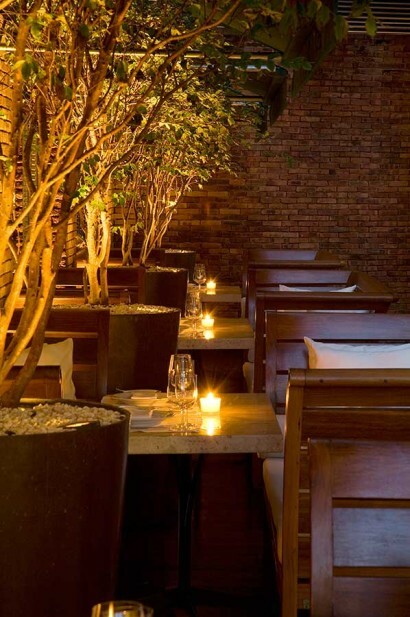 Lead by restaurateur Rogério Fasano, the kitchen is run by chef Paolo Lavezzini, who joined the Fasano team from the Michelin three-star Enoteca Pinchiorri in Florence. The refined menu features the diverse aspects of Mediterranean cuisine, with a special focus on seafoo. Breakfast, lunch and dinner are served daily in the main dining area as well as the inviting terrace. Ranked by Wallpaper magazine* as the number one hotel bar in the world. The rooftop infinity pool offers an unparalelled panoramic view of Ipanema beach. The bar menu offers a wide array of fresh-squeezed fruit juices, cocktails, and delicious al fresco dining throughout the day. The hotel extends its impeccable service to ipanema beach, with an exclusive stand directly across from the hotel that provides guests with lounge chairs, umbrellas, bottled water, magazines, as well as a selection of sun screen and other skincare products• Surfboard and bicycle rental may be arranged by the concierge. The eighth floor also has a fitness center equipped with the newest in cutting-edge fitness equipment. The Spa Fasano | Renata de Abreu is dedicated to holistic wellness, offering a variety of relaxing and beauty offerings. The Hotel offers a wide variety of event spaces, with a diverse choice of settings, food and beverage services coupled with an expertly trained staff to meet every guest’s needs. Press conferences and dressing room for performers. Structure: two different sized rooms, comfortable lounge, modern equipment, wireless internet access, adjustable furniture, air conditioning, phone for conference call• Cocktail party for up to 30 people, lunch and dinner for up to 20 people. Baretto-Londra: Ideal space for business and social events, product launches, shows, celebrations, press conferences and lectures. Surfboard and bicycle rental may be arranged by the concierge, who can also schedule a host of other outdoor activities in the city. 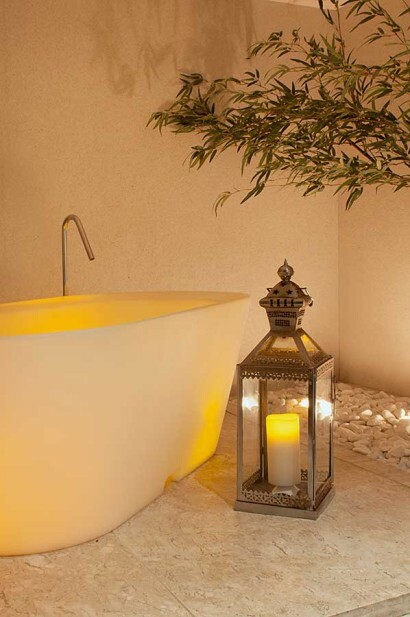 On the eighth floor of the hotel, the terrace houses the Vichy shower room for exclusive hydro-treatments. From the early stages of planning, concern for environmental issues lies at the foundation of our activities.